Currently, the indicator of broadband Internet penetration in Peru is quite low (below the average for the region). Nevertheless, 20 million connections are recorded in the country and the government takes active measures to stimulate the Internet services market. 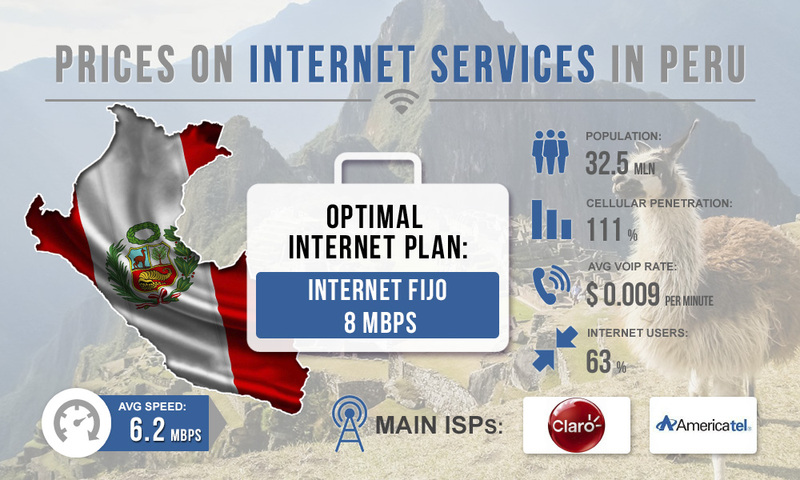 The average speed of the Internet in Peru is suitable for effective work in the field of VoIP GSM termination. What we have to do is to find out the price for the Internet connection in the country. 8 Mbps. Speed - up to 8 Mbit/s, cost - $22.6 per month. 12 Mbps. Speed - up to 12 Mbit/s, cost - $25.6 per month. 20 Mbps. Speed - up to 20 Mbit/s, cost - $28.6 per month. 40 Mbps. Speed - up to 40 Mbit/s, cost - $36 per month. 4 Mbps. Speed - up to 8 Mbit/s, cost - $21 per month. 6 Mbps. Speed - up to 8 Mbit/s, cost - $22.5 per month. 10 Mbps. Speed - up to 8 Mbit/s, cost - $27.1 per month. Choose your Internet plan depending on the amount of equipment involved in traffic termination. For each gsm gateway to voip channel, a minimum speed of 42 kbps is required. Mind that is not recommended to place equipment with a large number of ports in one location. The most advisable solution will be Internet Fijo 8 Mbps package. This speed is usually sufficient for effective termination, while the Internet plan will cost you only $ 22.6 monthly.